As the weather grows colder, and the days darker, Jews start to plan for Chanukah. Jewish holidays are governed by the lunar calendar and so the dates for Chanukah change each year. It usually falls a few weeks before Christmas. Like Passover, this holiday commemorates actual historical events. Its history is told in the books of the Maccabees, Jewish warriors commanded by a priest called Judas Maccabeus. In 199 BC Judea was colonised by Syrian Greeks. In 176 BC a Hellenistic Greek king, Antiochus IV, assumed power over Judea and started to persecute the Jews, outlawing their traditions and religious practices and defiling their Temple in Jerusalem. The Jews, led by the Maccabees, began a war of rebellion in 167 BC against their Greek rulers. In 164 BC the Maccabees recaptured Jerusalem and purified the Temple. The story of Chanukah tells how the Maccabees had only a minuscule amount of oil left to light the menorah (a branched lamp) in the Temple sanctuary. The oil lasted eight days instead of just one. That eight days of light, so needed in the darkness of the Temple, is what is known as the miracle of Chanukah. To commemorate this, Jews light their menorahs for all of the eight nights of this holiday. Using a candle called the ‘shamash’ to light the others, an additional candle is lit for each consecutive night until the end of Chanukah when the menorah glows with nine sparks of light. Jews are not obliged to go the synagogue especially for Chanukah so most of the holiday is observed at home. As a child I envied my non-Jewish friends their mince pies and brandy butter and wished my family could have a plethora of presents under an ornately decorated tree. But when the time came to light the menorah my envy was forgotten in the anticipation of watching candles illuminate the dusky living room. My sister and I would gather around the menorah placed near the window. My mother would carefully light each candle and then would lead us in singing a slightly off-key version of Maoz Tzur, an uplifting traditional Chanukah melody telling of rebellion and justice. After singing we would eat. On Chanukah it’s customary to have food made with oil. Doughnuts are usually served in British Jewish homes. But in South Africa we always had potato latkes – a type of fried pancake often accompanied with apple sauce. Not being overly fond of potatoes I would eat a little bit of the crispy outside but refuse the squidgy mess inside. Given my lifelong love affair with chocolate I much preferred the traditional Chanukah gift of milk chocolate coins called ‘Chanukah geld’. Each night my father would hand out these prized delicacies to my sister and me. Wrapped in gold tinfoil, they tasted slightly waxy and very sweet. As soon as my parents left the room I would beg and bribe my sister to give up her share to me. After we finished negotiating we would play with our plastic dreidels on top of the dining room table, away from the dogs who had a habit of running off with them. These four-sided spinning tops, imprinted with Hebrew letters, are customary for children to use on Chanukah. For hours my sister and I would compete with each other to win one game after another – the prize being two-cent coins – and stop only when we were too tired to sit up. As an adult I no longer play with dreidels but continue the tradition of lighting candles and eating chocolate coins. 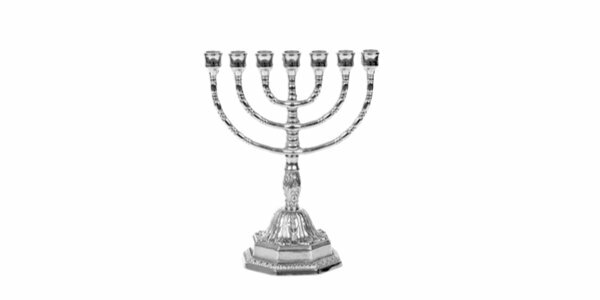 I inherited a silver menorah from my paternal great-grandmother Olga, who carried it with her when she emigrated from Germany to Israel during World War One. This slightly battered menorah has accompanied me whenever I have moved from one from country to another. After I light my Chanukah candle tonight I will recite these words from a learned sage, Rabbi Schneur Zalman: ‘A little bit of light dispels a lot of darkness’. In this troubled world, where there is so much horror and pain, all forms of light are desperately needed. The light that my menorah brings is not only for me but for the entire world. I have always believed this to be the true meaning of Chanukah.